RIZZO International Inc. is proud to announce their first anniversary and achievement of national certification as a Women’s Business Enterprise (WBE) and Women Owned Small Business (WOSB) by the Women’s Business Enterprise National Council (WBENC). To learn more about RIZZO International, Inc., please visit www.RIZZOintl.com. RIZZO International Inc. is a specialized global engineering and consulting firm focused on Analysis and Design, Construction Management, Geotechnical Engineering, Structural Engineering, Geology, Hydraulic, Hydrology and Hydrogeological Engineering and Earth Sciences. Our projects are typically in the Dams & Water, Power Generation and Infrastructure Markets. WBENC’s national standard of certification program is a meticulous process including an in-depth review of the business and site inspection. The certification process is designed to confirm the business is at least 51% owned, operated and controlled by a woman or women. Over the course of 3 days, over 400 attendees joined us in Bethlehem, PA for the 2018 PA Brownfields Conference. With over 20+ educational sessions and networking opportunities with more than 45 exhibitors the conference was a success. The conference opened on Monday with two mobile workshops (Brewing Brownfields Back to Life and Big Machines, Big Industry) followed by a “Get Acquainted Reception” at the Musikfest Café at ArtsQuest Center at SteelStacks, that gave attendees a birds-eye view of the historic Bethlehem Steel Blast Furnaces. Tuesday morning the conference started with a “Brownfields 101” session providing attendees an opportunity to learn the basics of Pennsylvania’s brownfields program before the start of the conference. Following this introductory session, we were welcomed to the conference by the Mayor of Bethlehem’s staff and opening remarks by PA Department of Environmental Protection Secretary Patrick McDonnell and U.S. EPA, Office of Land and Emergency Management Deputy Assistant Administrator, Steven Cook. Day two offered more than 12 different sessions for attendees to choose from, plus a full exhibit hall providing attendees the opportunity to lunch and learn, as they visit with vendors. Wednesday continued with 10 more sessions and an “Economic Forecast” by Don Cunningham from Lehigh Valley Economic Development Corporation (LVEDC). The conference concluded with a workshop “Winning EPA Brownfield Grants – Tips and Tricks for Success” as experts presented way to write a successful proposal. Overall, we want to thank all the attendees, sponsors, and committee members for contributing to a successful conference. Stay tuned for information on when the next PA Brownfields Conference will occur. The Conference is planned in collaboration between the Pennsylvania Department of Environmental Protection (DEP) and the Engineers’ Society of Western Pennsylvania (ESWP). ESWP hosted their 3rd Annual YMF Summer Social at the Engineers’ Society of Western Pennsylvania on September 7, 2018. The event was co-hosted by ASCE, ASHE, Tau Beta Pi, SAME, and WTS Pittsburgh Sections. This year the event brought together a record attendance of more than 60 young engineers in the Greater Pittsburgh area. The goal of this event is to seek and prepare the next generation of engineers by highlighting the diverse spectrum of engineering and related technical societies. Each co-host contributed a gift basket to raffle off and had a chance to inform attendees of their professional organization. New this year, ESWP implemented a 50/50 raffle, that the proceeds benefited the Red Door Program at Saint Mary of Mercy Church. St. Mary of Mercy Church, which is in the heart of downtown Pittsburgh, provides several kinds of assistance to people in need. The “oldest” of St. Mary’s services is the Red Door Program which began during the Great Depression. This program provides a bag lunch, Monday through Saturday to more than 100 persons each day. The program is underwritten by St. Mary of Mercy Church through various contributions made directly to the Red Door. After the conclusion of this event, ESWP donated a total of $80 to the Red Door Program. ESWP plans on implementing this event again in 2019 in hopes to exceed their contribution to a charitable organization. ESWP 1st Vice-President Dave Borneman was honored upon his retirement after 22 years as Director of Engineering & Construction at ALCOSAN. Dave’s career at ALCOSAN culminated almost forty years of engineering and management service to government agencies in Southwestern Pennsylvania. The event was held in the Members Dining room with many of Dave’s friends and colleagues, including current and former co-workers. 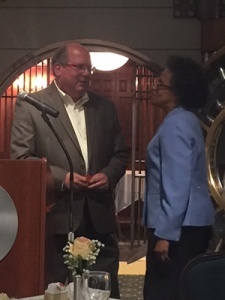 ALCOSAN Executive Director Arletta Scott-Williams recognized the many accomplishments achieved under Dave’s time at ALCOSAN. Dave is embarking on new challenges with Arcadis at its Wexford, PA office. H.F. Lenz, an MEP Engineering Firm, and an ESWP Corporate Member, posted some new job openings on our Re-Employment Web Site, which can be found here. Make sure to check those jobs out and to see how you can use the ESWP page to post job openings and resumes, for members and non-members to view. Monday at Treesdale Golf & Country Club turned out to be a wonderful day for the ESWP’s Annual Golf Outing. 64 players took to the golf course, and despite a brief rain shower at the start of the event, the weather was very cooperative. Players enjoyed some great golf, food and fellowship, all benefiting ESWP’s Student Outreach Activities. Guest Speaker Jim Colony shared a few Pittsburgh-themed sports stories before assisting Event Chair Wayne Johnson with the distribution of team and skill prizes. Thanks to all of our sponsors and raffle prized donors for helping to make the event a big success! Lennon, Smith, Souleret Engineering Inc. (LSSE) announces internal Ownership transition: LSSE, a 90 person civil engineering firm, headquartered in Coraopolis PA, founded in 1985 announced ownership and management transitions completing implementation of the firm’s Strategic and Ownership Transition Plans adopted in 2008. Effective on Friday, June 15, 2018 Lawrence J. Lennon, P.E., DWRE, Daniel S. Gilligan, and Larry W. Souleret, P.E., PLS, have sold their interest in the firm. They have transferred 100% ownership of LSSE to Kevin A. Brett P.E., Ned Mitrovich P.E., and Jason Stanton, P.E., longtime Principals and owners in the firm. In addition to each having 1/3 ownership of LSSE, they will assume the following management and corporate officer roles; Chief Executive Officer & President: Ned Mitrovich; Chief Operating Officer & Treasurer: Kevin A. Brett; and Chief Financial Officer & Secretary: Jason E. Stanton. Kevin Brett and Ned Mitrovich have accepted Directors positions formally held by Larry Lennon and Dan Gilligan, and will join Jason Stanton on the Board. Larry Lennon and Dan Gilligan will assume the role of “Principal Consultant”, while maintaining employment with LSSE.